vendredi 28 juillet 2017 , par Christian , Ouarese , OlivierL. , GregoryL. "They" arrived almost at the same time, but it is simply a coincidence of the calendar. 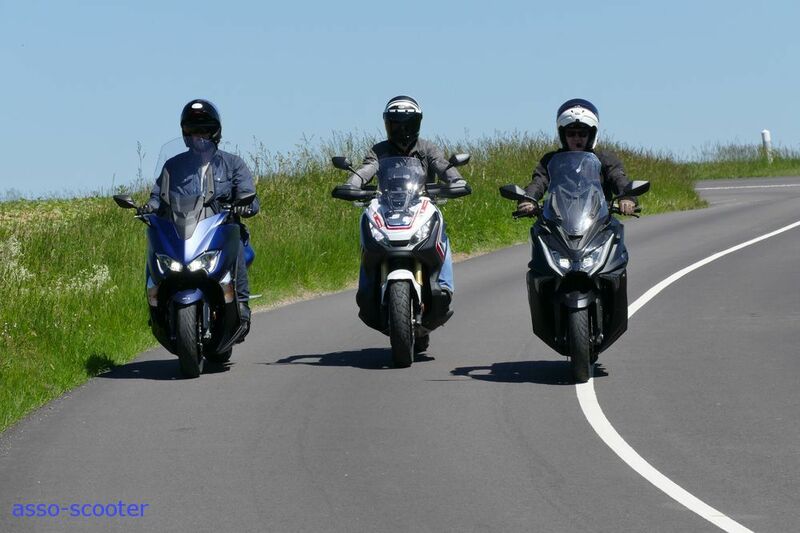 "They" are the maxi-scooters : Honda X-Adv, Kymco AK 550 and Yamaha T-Max. The opportunity to confront the star of the market with new contenders and to review the segment of the maxis, in full mutation. The star is called Yamaha T-Max. In 2001, we saw him arriving, growing, maturing. It is now part of our daily life for 16 years. Its challengers are the Honda X-Adv and the Kymco AK 550. The Honda X-Adv is the all-road version of the Integra but not only. Honda, from the Integra same mechanical basis, designed a brand new machine and this time with an under seat storage. For its side, Kymco with the experience of the Bmw partnership and its old maxis concocted a maxi-scooter full of promises. Both the X-Adv and the AK 550 benefit from the joint work from Asia and Europe offices. These few figures highlight how the debate that will take place between the three maxi 2017. The Honda X-Adv takes the cake of the most powerful engine. Its 54Hp are obtained at a rather low revolutions, 6,350rpm. The Kymco AK 550 arrives just behind with a power of 52.7Hp obtained at 7,500rpm. 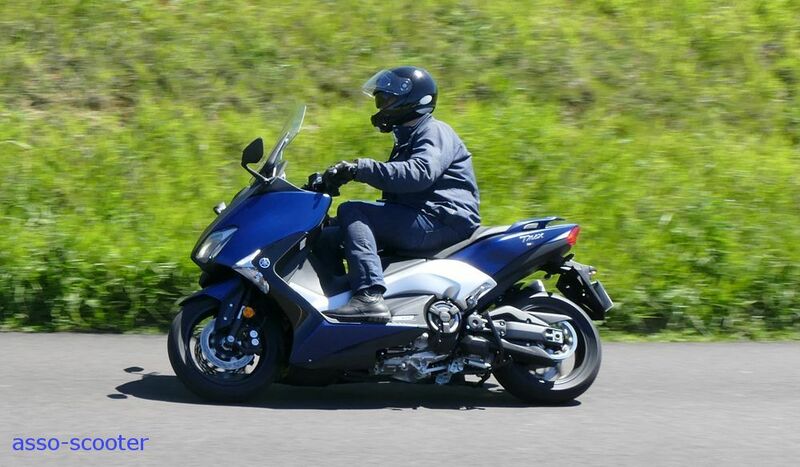 The Yamaha T-Max closes with 45.95Hp at 6.750rpm. In terms of torque, the X-Adv is obviously leading with 68Nm at only 4.750rpm. Following, the AK 550 has 55.64Nm at 5,500rpm and the T-Max which chases it with 53Nm to 5.250rpm. The Yamaha T-Max, as for him, in this DX version takes the cake of the most expensive scooter. To be complete on the T-Max, the basic version is at 11,499 €. Between the basic version and the DX version of our review, there is the SX version which is at 12,299 €. The SX version corresponds to the DX model, without the heated handles and seat and without the electric windscreen. The Kymco AK 550 is the cheapest of the three being under the 9,900 €. Surprisingly, the Kymco AK 550 is the shortest of the three but visually it seems the longest. Its dashboard is the most colorful and at night, it’s beautiful. The snag is that when it is sunny day, you no longer see anything. Talking about the under-seat storage, with the Kymco, you will be able to store an XL helmet and a small bag on the top. Behind the T-Max also allows to have a XL helmet and a smaller bag. The X-Adv is the smallest, a helmet and that’s all. These new scooters are now ultra-equipped, electronics is omnipresent, whether it is for comfort or safety elements. Among them, the Abs is installed on all three machines. To this, Yamaha adds the Traction Control System which will modulate the power transmitted to the rear wheel to optimize the traction. If all three have a Smartkey, the lack of a central button on the T-Max is finally more pleasant to manipulate to lock / unlock the fork the tanker. For the T-max, you have to reach the SX version to enjoy the TCS, and to benefit from the heating seat and handles, the version DX. In this version, you will also have the electrical adjustable windscreen. The X-Adv does have the tire pressure sensors but it does not have the heating handles. In terms of equipment, the Kymco AK 550 climbs to the top of the podium. With its price of only 9.890 €, it offers more than the others and this, from the basic version. With such an equipment, the protagonists’ commodos are becoming loaded. Yamaha has concentrated most of the functions on the left comodo on two rows. The first one, close to the thumb, groups the usual functions of headlight, direction light and horn. The second row is close to the center and includes all the other functions. It is well seen and well thought out. Presentations are made, now let’s ride. Before riding through the Vexin, you have to cross the town. In this exercise, the Kymco AK 550 is the best. He has a greater turning radius and a lower seat height than his competitors. The difference is minimal, 35mm with the Honda X-Adv and only 15mm with the Yamaha T-Max D but the smaller ones will appreciate. However, the T-Max has a lighter weight, 10kg less than the AK 550 and 22Kg less than the X-Adv. On the X-Adv, you sit straighter and higher. You will be one head over the flow of other vehicles. The mirrors of both Kymco AK 500 and Yamaha T-Max are mounted on the bodywork and in front. Those of the Honda X-Adv are attached to the handlebars. The rear view is excellent for all three but for the first two, you will not have to look away too much from the road to watch your rear. It is the Kymco AK 550 that wins at points in town. As soon as roads appear, our three maxi at last express themselves. On this type of ride, more than the maximum speed, it is necessary to highlight the abilities of each one to accelerate, resume and check the abilities of each one on all types of surfaces. On the Honda X-Adv, its torque of 68Nm, low revolutions at 4.750rpm and its robotic gearbox are wonderful. Whatever the revolutions or speed, a rotation of the wrist and the crew is restarted. A gentle pressure and the engine starts again on the engaged gear. A higher pressure and the gearbox translates this need for extra power by downshifting. At the entrance of turns, pressing the "-" button and the box drops down a report allowing you to approach a curve in the best conditions. No shock to report when shifting. One might even think that the X-Adv is equipped with a variator ! We have to notice that compared with the Integra the engine brake is less ... braking. On downshifting, you hear the engine going up in the revolutions but the slowdown is very timid. The Kymco AK 550 has been engineered to provide sensations close to motorbike. There is at first the sound of the exhaust, full, grave, and deported to the rear. That means that in normal driving, your follower will be defeaned, even if the sound is largely in norms. With its 52.7Hp at 7.500rpm and its torque of 55.64Nm at 5.500rpm, the AK 550 is doing very well. The engine responds, with a thrust starting at 4,000rpm and becoming frankly more powerful at 5,000rpm, which ends with a rage of 7,000rpm. Driving becomes amusing and alive. The Yamaha T-Max DX has totally different qualities. 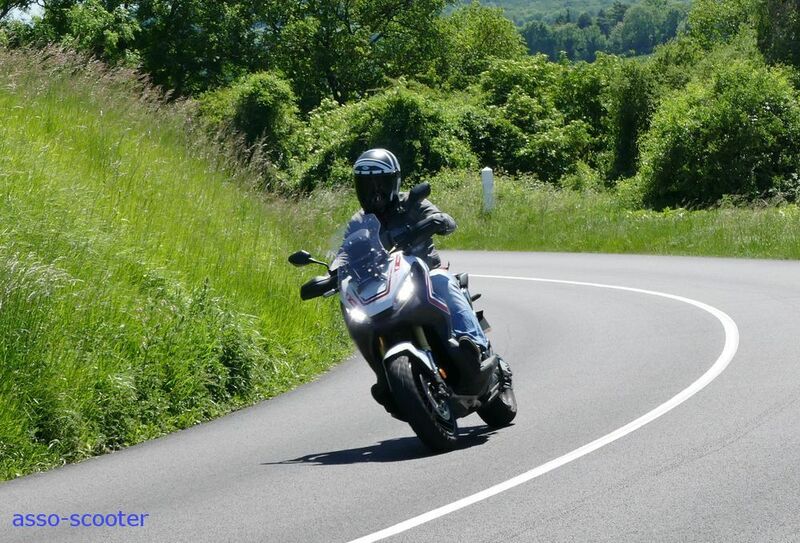 In Touring mode, the thrust begins to come towards 5.000rpm and continues all the way up to the maximum speed. It’s very linear. Too much, beacuse the sensations are a little lagging behind. It thrusts and even well, but the T-Max lacks character. It is too neutral. It lacks a small spark which would set fire to the powders. In Sport mode, the thrust starts at 1.000tr lower, as of 4,000rpm but the thrust is still as linear. Truly a shame because on the road, the featherweight of the T-Max is an invitation to have fun. Its drive direction is lively and allows left-right that the X-Adv and the AK 550 look with envy. Their direction is a bit heavier and they tend to expand, so they are less players. The left-right fast for them are more physical. This ranking is identical in accelerations. 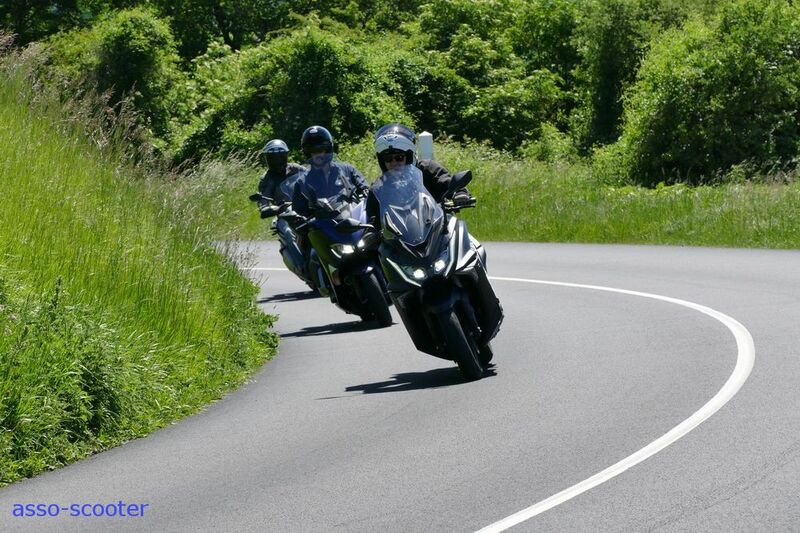 In order not to alter the results, the X-Adv remained in Drive, the T-max in Touring. The X-Adv is practically out of scope with its box that retrograde. Under these conditions, at 80km/h, after downshifting, it quickly shows its rear light to the other two scooters. It is between them that the battle is. 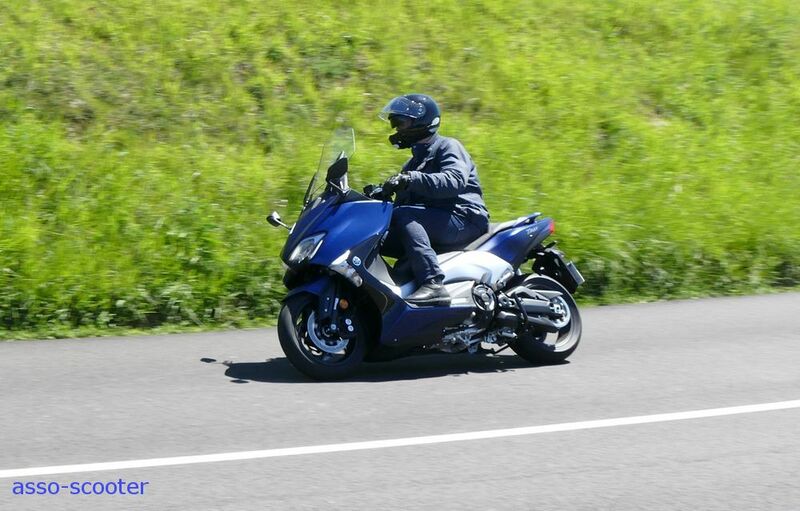 The Kymco AK 550 takes the lead but the T-Max clings. He sees half of the AK 550 going ahead, then ¾, and begins to see his superb line of rear lights then the T-Max goes up. Again ¾, then half but this time, it is the T-Max. And the driver of T-Max keeps smiling again because turn of wheel revolutions after of wheel revolutions, the T-Max goes up. No suspense for this type of route, the Honda X-Adv holds the top of the pavement. Its maximum speed leaves the "small" 550cc behind. Behind, AK 550 and T-Max ar very close. T-Max is ahead with few advantages. For protection, the T-Max’s electric windscreen is ideal. A simple pressure on the button and the screen raises so silence is made. Electricity works well despite wind speed and pressure. We noticed that in high position the engine revolutions lose 500rpm but silence is royal. We could not have a test of these three maxi-scooters in rainy weather but leg protection looks better on AK 550 and T-Max. Whether on the road or on the highway, the T-Max expresses a hum at the cockpit. This is the T-Max sound but it is finally quite tiring. It is on the Yamaha T-Max that your passenger will be the best installed. The seat is a little too wide but he or she will have the more space on the seat. He may choose to tighten or not the driver. The large holding handles will allow him to tighten during accelerations. With well-positioned footrests, he can also be lift up easily on potholes. The rear suspension is also more tender. Well seen, the stall of the body. It allows the passenger to tighten the body at the level of the calves to maintain also. On the Kymco AK 550, the passenger space is reduced in length. The passenger is therefore rather close to the driver-pilot. The holding handles are well seen to resist to the muscular accelerations of the scooter. Here too, the handles and the bulge of the body will allow the passenger to hold, even if the backsplash will prevent him from falling. The suspension is less tender for the passenger who will be happy to take a few steps at a stop. The Honda X-Adv has more mellow suspensions but the seat is harder. The passenger will pest against the handles that he must go under his thighs to hold, on the condition they are not too large. Otherwise, he will have to handle the driver. Kymco insists on the fact that its AK 550 is equipped with Brembo brakes on the front. And that’s right. At 50km / h, the AK 550 only needed 6.30m to stop. The T-Max is not outdone with 6.40m. They are only 10 centimeters but they are there. The X-Adv need 6.80m to stop. For him, it is not the brakes that are to be questioned but his trail tires. They do not stick enough the road to have reduced braking distances. On the rear brake, on the AK 550, the Abs is triggered quickly, very quickly. At the handlebars, finally, you feel that only the front brake acts to stop the mount. On the T-Max, the Abs is also triggered but later. The result is that braking seems more balanced between front and rear. From this point of view also, the mass transfer is less pronounced than on the AK 550. On the X-Adv, the Abs also triggers but remains at the level of the T-Max. During our review, the Honda X-Adv was the most sober with a consumption of 3.21l / 100. Yamaha T-Max arrives behind but with a fuel consumption of 5.14l / 100. The AK 550 heels with 5.48l / 100. In other words, for these two scooters, the consumption is identical. With their 15-liter tanks, the range is about 300km, varying according to the style of driving. 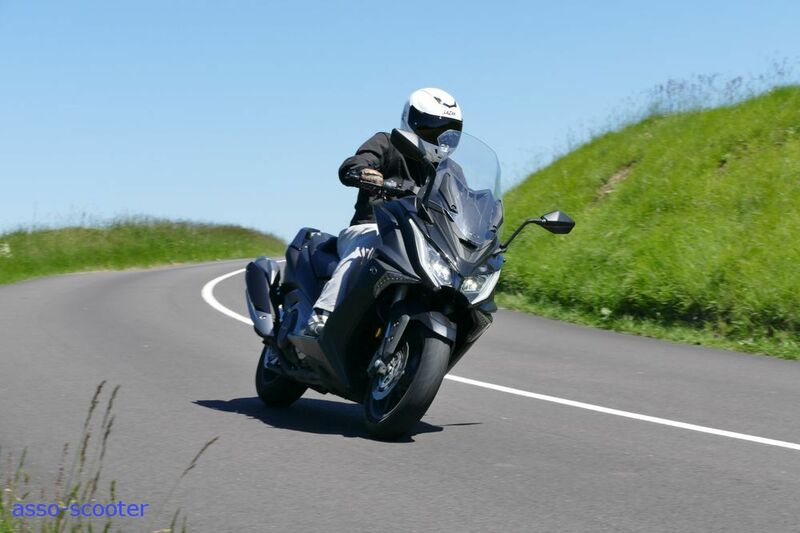 If the X-Adv tanker is the smallest of the three with only 13.1 liters, its record consumption allows a range of 400km, also varying according to the driving style. There are the measures, which is explicable, and then there is the feeling, the sensations. Our testers expressed their subjective opinions about the line, the engine and the pleasure. * Line : different from all that exists actually, the design is harmonious, aggressive but not too much. With its HTC and Rally colors, I compare it to a mini Africa Twin. * Engine : torquy, combined with an exceptional driven gearbox, it just lacks some speed limit. Added to this, a bird appetite, it has all good. * Pleasure : excellent, comfortable thanks to its suspensions (not to the seat), the motorcycle frame offers a very good stability by all circumstances. Small caveat on the rear ABS too intrusive. * Line : a more aggressive copy in the drawing of a Tmax. With the front of a Predator, it does not go unnoticed. * Engine : what a sound ! A full engine at all speeds. 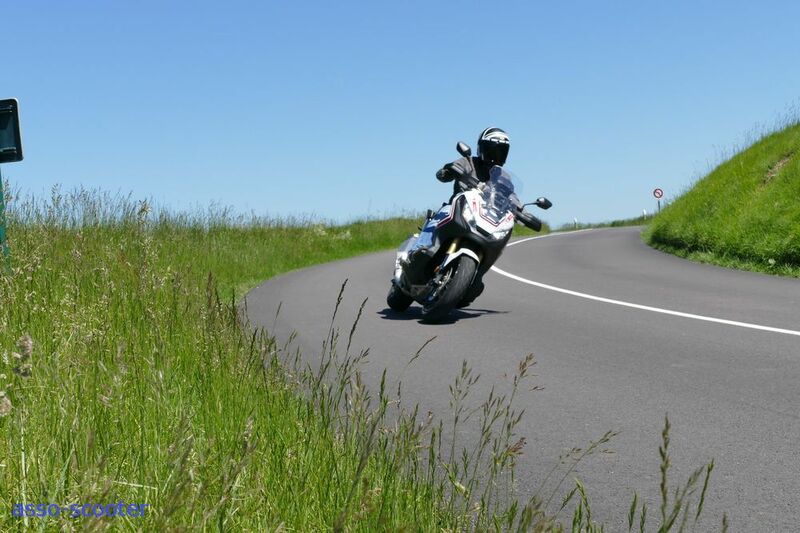 * Pleasure of driving : less agile than the Tmax, it is however much more precise drive train, with a tremendous. Lack of a little suspensions comfort. * Line : timeless, but I find the front of the new version less successful than the old generation. * Engine : with a very well calibrated variator, it is nervous at starting. The sound of the motor recognizable among thousands does not make me vibrate. * Pleasure of driving : agile, sporty, comfortable, it is not for nothing that it is number 1 of sales for years. * Line : avant-garde, seems to be a scooter / motorcycle with an innovative concept including the front and the driving position. A little “I do not know what” of baroudeur (handlebar broad and protection type trail, raised back). * Engine : excellent engine, seconded with a gearbox that shifts quickly or flexibly according to the programming. Beware of the first one which is a bit sportive and very short. The engine in mode D is stately pace and at the limit of the sleepy mode, in 2nd, it changes completely in mode S. The cartography has been well worked. * Line : the front is not bad enough aggressive with its beak. The lines are cut straight and gives a sport side. The dashboard is quite nice, though sometimes unreadable, with notifications from your phone. The V-shaped taillights give a futuristic side quite noticeable. * Engine : attacks, nothing to say, one feels the acceleration. Engine that knows how to be heard. * Line : beautiful line pretty well worked but so seen and reviewed but that does not go out of fashion. Good finishes, good plastic, nice dashboard. * Engine : a flexible motor and fairly linear, at ease once launched on highway. Typical buzzing. * Pleasure : a good driving pleasure because the scooter is beautiful, the blue dials too. It is a scooter that flatters the ego I think and gives a slight smile to the lips. Good choice as emblematic model comfortable with a well-established after-sales service. * Line : very original. Not frankly beautiful but frankly appealing. Like a 1200G or other trails. * Engine : excellent engine, well assisted with the gearbox. Flexible at low speed and quite torquy, it ensures in all situations but, a little wise, it does not vibrate the motorcycle that sleeps in us, despite its great similarity to motorcycle motors precisely. * Pleasure : for a scooter is out of the ordinary, he proposes more than what one would dare to ask. A motorcycle transformed into a scooter. * line : the front is banal, rear is successful. So a nice line. Too bad it exists only in black or gray ... a little sad in the end. * Engine : very full with steady rises. Very nice noise. * Pleasure : healthy and rigorous ride qualities, effective braking, good comfort. High-level motor. * Line : to my opinion the most successful T-Max. The back is particularly beautiful. But this remains in line with the T-Max, which is the ultimate scooter icon and therefore changes pretty little generation after generation. * Engine : very nice, big progress at low speed. Here again the famous T-Max sound was carefully preserved. We do not upset the habits of fans of the T-Max icon. * Pleasure : a super-pleasant scooter to drive, as usual with the T-Max. But when you bring the overall level of the scooter to its price, the account is not there since it is equal game with the Kymco. A high level machine. Considering points, the Yamaha T-Max wins with a total of 360 points. Winning at points but not by knockout. It is followed by the Kymco AK 550 and the Honda X-Adv which arrive equally placed with 356 points each one. A very short victory points out the fact that these three scooters are finally very close. Three scooters, three different styles that come to energize a previously frozen segment. The T-Max is a known and recognized scooter. Seated behind the handlebar, you do not need a business card, it poses you socially and economically. You do not even need to turn the handle, all know ! With the AK 550, unknown for the moment, you are much more on basics that do not clutter with images. The sensations in the pure state, the raw pleasure that a sophistication does not bother, that is the AK 550. For the X-Adv, you have either of them. You have a look staggered but real efficiency, a look of adventurer but you will be able to parade on the Champs Elysées, a suit-tie fabric lattice. At the time of choice, difficult to say which of the three is the best. Question of impulse, of feeling, totally subjective and also of purse ! And that particular point, you are the only you one who can see. 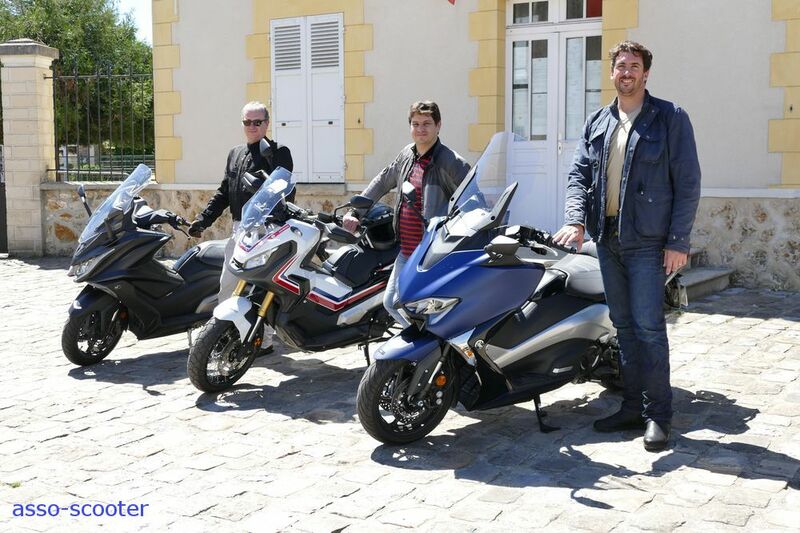 Essai Yamaha T-Max DX 2017 : Euro 4 pour la forme. Note : AK 550 dashboard blinking is normal. 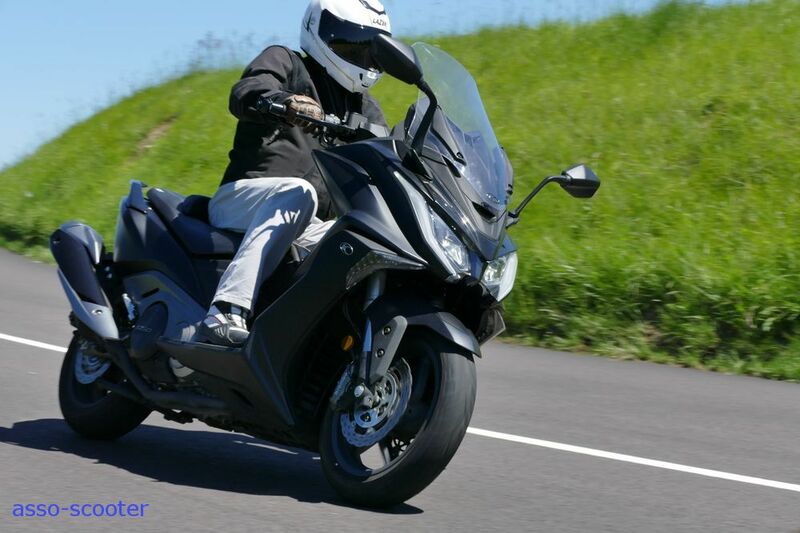 T-Max SX Sport Edition : exclusif et dynamique, encore plus !